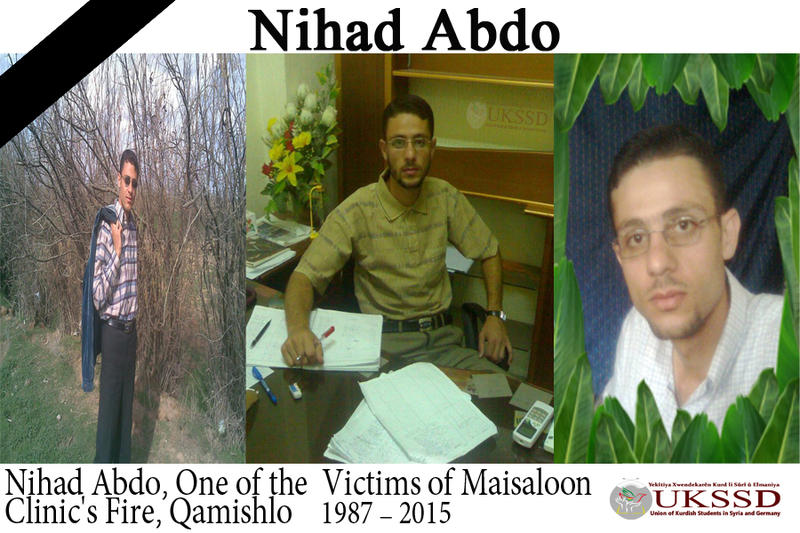 Nihad Abdo | Maisaloon Clinic’s Fire, Qamishlo, Syria – DOZ e. V.
A fire broke out in Maisaloon clinic in Qamishlo city, northern Syria this morning 31.05.2015 and resulted in the death of dozens of innocents including children, women, doctors, and workers. Although Kurdish Unit Forces and local community tried hardly rescuing victims from flames of fire that devoured each corner of the building, still the lack of necessary basic equipments prevented them to rescue victims blocked inside the clinic. Nihad Abdo a student graduated recently from laboratory department who continue his studies in specialization such as thousands of students in Kurdish Region due to ongoing conflict and siege laid to Kurdish Region inside Syria. Therefore, he decided to use his laboratory skilss in serving local community and got employed in Maisaloon Clinic in Qamishlo, Northern Syria. Nihad as many other young professionals decided to stay inside Syria to help civilians due to teh lack to doctorsm medicine, and medical equipments. Since the conflict erupted in Syria, most INGOs working for humanitarian response for Syria didn’t provide enough aids that could meet the needs of local community in Kurdish Region. One main reason behind the fire of Maisaloon Clinic is the use of gas strokes, petrol, and simple medical equipment to cover the medical needs of local community, said the ASAYISH “Kurdish Security Department” that made first investigation in the accident. UKSSD e. V. calls on governments , INGOs, and UN-OCHA to take the reasons behind such accidents into consideration and provide enough aid to Kurdish Region in many sectors such as health and humanitarian aid. UKSSD e. V. hopes that political issues or governmental pressure should not be a barrier in rescuing Syrian people in Kurdish Region in Syria. UKSSD e. V. expresses its hearty condolences to families of victims for their lost. May heaven be their final resting place.